An Afghan man who could have faced the death penalty for converting to Christianity has been freed from jail. Abdul Rahman was charged with rejecting Islam but his case was dismissed after he was deemed mentally unfit to stand trial, officials said. Efforts are under way to find a country that will give him asylum. 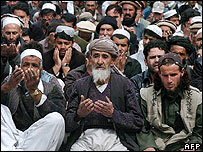 There was international outcry over the case, which has highlighted ambiguities in Afghanistan's constitution over the interpretation of religious issues. 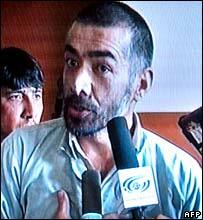 Mr Rahman was released from Kabul's main high security Pul-e-Charki prison late on Monday. It is not clear where he has been moved to while awaits the results of his asylum plea. "I can confirm that he was released," said Justice Minister Sarwar Danish. "He is not in detention. I do not know if he is with his family or where, but he has been acquitted." UN spokesman Adrian Edwards said the organisation was working with the Afghan government to solve the asylum issue. He expected asylum would be granted by a country "interested in a peaceful solution". The Italian foreign ministry said it would seek cabinet approval to offer him asylum. Afghanistan's Independent Human Rights Commission denied Mr Rahman had been declared sick to get out of a controversial situation. "We have to respect public opinion, but... from the very first day, our opinion at the commission was that he was not looking well enough to be on trial," its chairwoman, Sima Samar, told the BBC. Mr Rahman was arrested about two weeks ago. Under Afghanistan's Sharia legal system he could have faced execution if he had refused to renounce Christianity. The BBC's Sanjoy Majumder in Kabul says the Afghan constitution enshrines personal freedom and recognises the Universal Declaration of Human Rights. But it also says the country's laws are based on Islamic Sharia law and there is an explicit article which says no one has the right to contravene Islam. It is deliberately ambiguous because it attempted to address Western concerns over democracy as well as placate domestic hardliners who favour an Islamic state, our correspondent says. The case sparked Western criticism, with the US, Britain, Canada, Germany, Italy and Sweden among those demanding Afghanistan respect international laws on freedom of religion and human rights. Pope Benedict XVI also asked for Mr Rahman to be freed. Mr Rahman's family had asked the Supreme Court to dismiss the case against him, saying he suffered from mental illness. Judge Ansarullah Mawlavizada told the BBC there was considerable doubt that Mr Rahman was fit to stand trial. According to Judge Mawlavizada, Mr Rahman appeared "disturbed". The judge also said it was not clear if the accused was really an Afghan or a citizen of another country. Several hundred people protested on Monday against the case's dismissal. Mr Rahman has lived outside Afghanistan for 16 years and is believed to have converted to Christianity during a stay in Germany.